Beethoven, Ludwig van (1770-1827), German composer, generally considered one of the greatest composers in the Western tradition. Born probably on December 16, 1770, in Bonn, Beethoven was reared in stimulating, although unhappy, surroundings. His early signs of musical talent were subjected to the capricious discipline of his father, a singer in the court chapel. In 1789, because of his father's alcoholism, the young Beethoven began supporting his family as a court musician. His early compositions under the tutelage of the German composer Christian Gottlob Neefeparticularly the funeral cantata on the death (1790) of Holy Roman Emperor Joseph IIsignalled an important talent, and it was planned that Beethoven study in Vienna with Wolfgang Amadeus Mozart. Although Mozart's death (1791) prevented this, Beethoven went to Vienna in 1792 and became a pupil of the Austrian composer Joseph Haydn. In Vienna, Beethoven dazzled the aristocracy with his piano improvisations; meanwhile, he entered into increasingly favourable arrangements with Viennese music publishers. In composition he steered a middle course between the stylistic extravagance of the German composer Carl Philipp Emanuel Bach and what the public had perceived as the over-refinement of Mozart. The broadening market for published music enabled him to succeed as a freelance composer, a path that Mozart a decade earlier had found full of frustration. In the first decade of the 19th century Beethoven renounced the sectional, loosely constructed style of works such as the popular Septet for strings and winds op. 20 (1800), and turned to a fresh expansion of the musical language bequeathed by Haydn. and Mozart. Despite his exaggerated claim that he had never learned anything from Haydnhe had gone so far as to seek additional instruction from the German composer Johann Georg AlbrechtsbergerBeethoven soon revealed his complete assimilation of the Viennese Classical style in every major instrumental genre: symphony, concerto, string quartet, and sonata. The majority of his works which are most often performed today were composed during the decade bounded by the Symphony no. 3 (Eroica, begun 1803; first performed, 1805) and the Symphony no. 8 (1812), a period known as his heroic decade. Beethoven's fame reached its zenith during these years, but the steadily worsening hearing impairment that he had first noted in 1798 led to an increasing sense of social isolation. Gradually Beethoven settled into a pattern of shifting residences, spending the summer in the Viennese suburbsHeiligenstadt was a favourite choiceand moving back to the central city in the autumn. In 1802, in his celebrated Heiligenstadt Testament, a quasi-legal letter to his two brothers, he expressed his agony over his growing deafness. After 1805 accounts of Beethoven's eccentricities multiply. He performed in public only rarely and made his last appearance in 1814. Although reports circulated among Beethoven's friends that he was constantly in love, he tended to choose unattainable women, aristocratic or married or both. In his letter to the Immortal Beloved (presumably never sent and now dated at 1812), he expressed his conflicting feelings for the woman who may have been the sole person ever to reciprocate his declarations. The long-debated riddle of her identity was solved beyond reasonable doubt in 1977 by the American musicologist Maynard Solomon. She was Antonie Brentano, the wife of a Frankfurt merchant and a mother of four. Conceivably, Beethoven's sense of virtue and fear of marriage contributed to his flight from this relationship, with its deeply shattering conflicts. In 1815, on the death of his older brother, Casper Carl, Beethoven devoted his emotional energies to a costly legal struggle with his sister-in-law for custody of her 9-year-old son Karl. The mother received a temporarily favourable ruling, and only the intervention in 1820 of Beethoven's most powerful patron, the Archduke Rudolph, won the composer custody of his nephew. Beethoven was not an ideal parent and enormous friction developed between the two, contributing to Karl's attempted suicide in 1826. By 1818 Beethoven had become virtually deaf and relied on small conversation books, in which visitors wrote their remarks to him. He withdrew from all but a steadily shrinking circle of friends. Except for the premi�res of his Symphony no. 9 and parts of the Missa solemnis in 1824, his music remained fashionable only among a small group of connoisseurs. His prestige was still such, however, that during his last illness he received huge outpourings of sympathy. He died in Vienna on March 26, 1827; tens of thousands witnessed his funeral procession. Beethoven's major output consists of 9 symphonies, 7 concertos (5 for piano), 16 string quartets, 32 piano sonatas, 10 sonatas for violin and piano, 5 sonatas for cello and piano, an opera, 2 masses, several overtures, and numerous sets of piano variations. He has traditionally been referred to as the bridge to Romanticism, and his output is simplistically divided into three roughly equal periods. Today most scholars view him as the last great representative of the Viennese Classical style, a composer who at two important junctures in his life turned away from the aesthetic of the emerging Romantic period in favour of renewed exploration of the legacy of Haydn and Mozart. After arriving in Vienna, Beethoven alternated between compositions based openly on Classical models, such as the String Quartet in A Major op. 18, no. 5 (1800, patterned on Mozart's String Quartet K. 464) and those based on looser Italianate structures, such as the song Adelaide (1795). The new manner that Beethoven referred to in 1802 marks his first return to the Viennese Classical tradition. Although his works of the decade 1802-1812 project a heroic aura, musically they represent an expansion of the tighter forms of Haydn and Mozart. This is apparent both in works of unprecedented scope, such as the Eroica symphony and the Piano Concerto no. 5 (Emperor, 1809), and in formally compressed works such as the Symphony no. 5 (1808) and the Piano Sonata op. 57 (Appassionata, 1805). In these works he proved that a style founded on unprecedented thematic integration and on the harmonic polarisation achieved by manipulating opposing keys could produce works of remarkably expressive power. The completion of the Symphony no. 8 and the fading of hopes for a successful relationship with the Immortal Beloved left Beethoven in a sea of compositional uncertainty. The prodigious output of the previous decade ceased. The few works of the years after 1812such as the op. 98 song cycle An die Ferne Geliebte (To the Distant Beloved, 1816) and the Piano Sonata in A Major op. 101 (1817)took on an experimental hue, reviving and expanding on the more relaxed musical structures Beethoven had employed in the 1790s. The handful of open-ended, cyclic works of this period exercised the most direct musical influence on the succeeding generation of Romantic composers (apparent, for example, in the song cycles of the German composer Robert Schumann). In 1818 Beethoven inaugurated a second return to the tightly structured heroic style. The move was marked by the Piano Sonata in B-flat Major op. 106 (Hammerklavier), a work of unprecedented length and difficulty that left behind the accomplished amateur performer once and for all. The works of Beethoven's last period, rather than being composed in sets or even in pairs, are each marked by an individuality that later composers could admire but scarcely emulate. In the Ninth Symphony and the Missa solemnis he gave expression to an all-embracing view of idealised humanity more rooted in the Enlightenment than in Roman Catholic doctrine, and more compelling than the equally lofty ideals portrayed a decade earlier in his only opera, Fidelio (1814). The dominant private dimension of Beethoven's late style gave rise to the five string quartets of 1824-1826, the last two of which were written without commissions. In these works Beethoven achieved an ideal synthesis between popular and learned styles, between the humorous and the sublime. Judged inaccessible in their time, the string quartets have becomeas has so much of his musicyardsticks against which all other musical achievements are measured. Beethoven's lifelong habit of sketching musical compositions as he worked them out became even more important as he grew older. The more than 7,000 pages of drafts entered outdoors on scraps of paper or in small notebooks, as well as the more extensive notebooks he filled up indoors, form one of Western music's most enduring monuments to musical creativity. 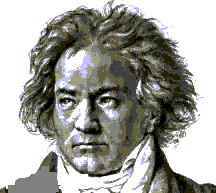 Perhaps Beethoven's most profound influence was in changing the perception of the role of the composer from that of a craftsman producing work to order for Church or aristocratic patron (a role which Mozart and Haydn had been obliged to adopt), to an artist producing work to meet his own artistic needs, financially independent through publishing and performing his worksa change in perception that is one of the hallmarks of 19th-century Romanticism. In this respect he paralleled the influence of Byron in poetry or Turner in painting. His explicit musical influence was limited. For some composerssuch as Johannes Brahms, who produced no symphony until his 40sBeethoven's presence was paralysing. The German composer Richard Wagner invoked Beethoven's Ninth Symphony, particularly its choral finale, as support for his own vision of the music drama. Not until the late-Romantic symphonies of the Austrian composers Anton Bruckner and, especially, Gustav Mahler, was Beethoven's symphonic ideal carried to what many regard as its final stage of development. Today Beethoven's works form the core of orchestral and chamber music repertoires the world over.